This month in the Teacher’s Corner, we will explore four educational approaches designed to provide students more opportunities to apply, analyze, evaluate, and create in the classroom. This week, learn how to incorporate the 21st Century Skills into the English language classroom. Teaching is a dynamic profession. It changes year to year depending on the classes we teach and the students we have. However, the world of education has remained largely the same for the last one hundred years. Our classrooms are still teacher-centered. In the teacher-centered classroom, the role of the teacher is to deliver information to students and test the students on their ability to remember and understand that information. The students are passive learners who understand and remember information, but do not analyze, apply, evaluate, or create information. Many educators are beginning to argue that this approach to teaching is now outdated. They argue schools need to change to meet the increasingly technology-based and globalized world in which our students will live and work in the future. This globalized world requires students do more than understand and remember facts. It requires them to apply, analyze, evaluate, and create new ideas and products. Some educators argue that our current classroom approach only serves the most basic learning: understanding and remembering. 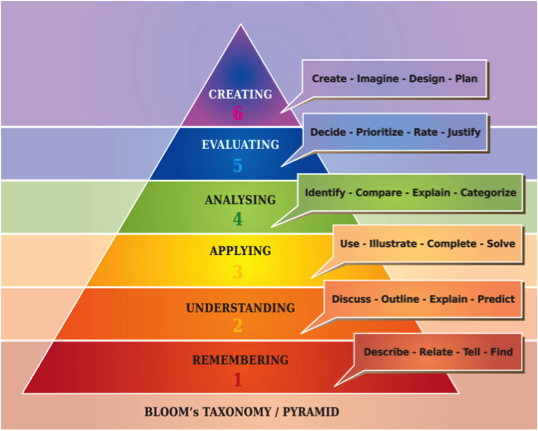 In Bloom’s Taxonomy, the skills of understanding and remembering are the foundation of learning. However, above these skills are the more active forms of learning: applying, analyzing, evaluating, and creating. It is these higher order skills that are shaping current educational trends. Educators are asking how we can better integrate the higher order skills of Bloom’s Taxonomy into our classroom. This will better prepare our students for a world where information is everywhere, and what we do with that information will decide our future success in our careers. The goal for each trend in this month’s Teacher’s Corner is to provide a basic overview of these educational trends and provide resources to help you learn more, week-by-week. With this, teachers will be able to discover the trend that best fits their classroom context and implement these ideas over time. Each of these trends uses the iterative design approach. In iterative design, changes are made, tested, and evaluated in the real world. As teachers, this means trying out new ideas in class, seeing how well they worked, and then making changes to improve our idea. The more improvements we make, the better the activity becomes. If we want our students to be creative in the classroom, we must serve as an example, so check out this month’s Teacher’s Corner for ideas on how to apply, analyze, evaluate, and create the classroom of the future. One of the largest trends in education worldwide is the recognition that education needs to serve an increasingly digital world. Classrooms that exist as ‘technology free zones’ are increasingly falling behind in preparing students for the jobs of the future. As a result, schools are changing focus from traditional teaching, with its focus on facts and information, to teaching the 21st Century Skills, with an emphasis on digital literacy. These 21st Century Skills have a focus on problem-solving, creativity, and communication. In the classroom of the future, students will need to know how to find, evaluate, and process information from a wide variety of sources. This week, we will explore the 21st Century Skills and find ways to incorporate them in our classrooms. This focus on digital skills should play a strong role in the 21st century English language classroom as well. Although it is hard to estimate accurately, around 50% of all the material on the Internet is in English (Pimienta, Prado, & Blanco, 2009). As English teachers, we can help our students access and understand this digital world. To better help our students prepare for the digital world and the digital jobs of the future, we should also consider how to make our classrooms 21st century classrooms. Global Awareness: Teachers should use classroom activities to promote global understanding in students. This can include classroom organization, such as having students from different cultures and backgrounds work together on class projects to promote cultural understanding and awareness, or, for monolingual/monocultural classrooms, having students read English language materials that are focused on non-English speaking areas of the world. An example of this is creating classroom activities around Google’s Beyond the Map project, which gives viewers an interactive tour of Rio de Janeiro, or using the international news stories and radio broadcasts of Voice of America in the classroom. For more ideas on using global affairs in your classroom, check out the March 2016 Teacher’s Corner or the American English Webinar Series. Creativity and Innovation: The 21st Century Skills have a strong focus on students creating and innovating with the information they have in the classroom. This requires teachers to move from more traditional assessments, such as quizzes and tests, to more open-ended assessment approaches, such as student portfolios. The goal in using portfolios is to encourage students to use the target language in context, rather than by testing knowledge of just grammar or vocabulary. This can include asking students to create videos, write journals, create podcasts, or stage classroom plays in English for classroom assignments. For more on using portfolios in the classroom, check out the January 2004 issue of English Teaching Forum magazine. Information and Media Literacy: The world has shifted from an industrial economy to an information age economy. The old industrial economy focused on the building and making of products. The information age economy is focused on creating and accessing information through computers. In the information age economy, it is important for students to understand how to access information and evaluate that information. The 21st Century Skills educational model encourages the use of transmedia literacy. Transmedia literacy is the ability to understand information from a variety of sources and make connections between them. For example, in the English classroom, students can read an English-language news story, then watch a video on the same subject matter. Teachers can then quiz the students on not only the content of each story but also the differences and similarities between each story. This encourages students to think across different types of media and understand the strengths and weaknesses of each. For more on media literacy, check out our Massive Open Online Course on English for Media Literacy. The 21st Century Skills model fits well inside the English language classroom as this approach encourages students to engage with a globalized world. We can help our students prepare for this globalized world by incorporating more interactive activities into our classrooms. Activities that require students to make videos, audio journals, or web-based writing not only allow them to practice their language, but also to learn technology skills along the way. Pimienta, D., Prado, D., & Blanco, Á. (2009). Twelve years of measuring linguistic diversity in the Internet: balance and perspectives. Paris: United Nations Educational, Scientific and Cultural Organization. Teachers looking to use technology in the classroom can face difficulties, especially if your students don’t have regular access to a computer. However, as smartphones and tablets become more common, we can take advantage of them for classroom activities. This bring-your-own-device (BYOD) approach can help incorporate technology into our classroom practice without the need for every student to have a personal computer. In this week’s Teacher’s Corner, we will explore a variety of Internet-based tools that can be used in the BYOD classroom. Each of these tools has their own strengths and weaknesses, so it is important to explore them thoroughly before using them in the classroom. The benefits of each can be hard to determine as it will depend on your classroom context, learning objectives, and student needs. However, Chapelle (2001) outlines six criteria for evaluating technology tools for the classroom. These six criteria can be an effective way of thinking about technology tools and whether or not you should use them in your classroom. 1. Language learning potential: Does the technology allow for my students to acquire language or use the language in practice? 2. Learner fit: Does the technology match my students’ needs and abilities? Will it be easy for them to use and understand? 3. Meaning focus: When using technology, the teacher must decide how to use the technology to teach specific language material. Be sure to ask yourself: how can I use this technology to deliver learning to my students? What do I want to teach with this technology? 4. Authenticity: Does the technology let my students use their language in creative ways? Do they get to see and use language in a specific context? 5. Positive Impact: Using technology in class should help our students become successful. Be sure to evaluate all technology on its ability to motivate and encourage students. 6. Practicality: Can I use this in my classroom? After positive impact, this is the most important criterion for technology in the classroom. Think about ways you may need to change approaches depending on your students and classroom. Not all students may have a smartphone they can use in classroom activities, so consider having students do the activities in pairs or small groups. A wide variety of digital tools exists for increasing classroom participation for students. Each of the tools listed below take advantage of the BYOD approach to encourage all students to ask and answer questions. By interacting through their own phone, tablet, or computer, students can participate at the same time instead of one-by-one when they raise their hands to answer questions. The BYOD approach can also assist less confident students or shy students by giving them a chance to ask and answer questions without having to speak to the entire class. It is important to consider how each of these tools can benefit the classroom as well as encourage students to be more active in class. To do this, think about how each type of tool may fit into your lesson plan or classroom objective. This requires we take our time by experimenting and exploring with a variety of these tools before using them in a class setting. Each of the specific tools listed below have excellent tutorials on their websites that can guide you through learning how to use them and implement them in class. The tools are grouped based on the Before, During, and After approach to classroom instruction. In the Before stage, we want to draw students’ attention to the topic and activate their background knowledge on the topic. In the During stage, we want to teach the material of the day, for example grammatical forms or specific vocabulary. Finally, in the After stage, we want to evaluate our students’ understanding of the material presented in the During stage. PollEverywhere – PollEverywhere provides teachers a platform to create questions to ask students during class. Teachers can create multiple-choice questions, open-ended questions, or ranking questions. Students answer using their own device with their responses displayed on the teacher’s screen. Ideal for large classrooms, this software can help students that are shy or quiet in class become more interactive by providing them a space to ask and answer questions. Socrative – Socrative lets teachers ask questions to students and see their results instantly. As each student answers the question, the teacher’s screen gets updated, automatically allowing them to see how each student has understood the material. Micropoll – Micropoll is a platform for creating questions that can be added to websites or an online course management system, such as Moodle or Blackboard. Students can then access the class online and answer the questions via a multiple-choice format. Google Slides – Similar to traditional PowerPoint slides, Google Slides allows many people to join a presentation and work on it together. In classrooms without a projector, or that use a television monitor, students can join the presentation through their phones and follow along making it easier to see the information being presented. Prezi – Prezi is a story-focused presentation system. In Prezi, slides are created individually and then linked together to create presentations which are more story-like. Students can also join Prezi via their own device to follow along or even add slides or information. Nearpod – Nearpod is similar to a traditional PowerPoint but adds a layer of interactivity. In the presentation, teachers can add quizzes which can be scored in real time. Students can follow the presentation using their phones and answer the quiz questions as well. Videos, interactive pictures, and audio can also be added to the presentations to make them more interactive. Kahoot – Kahoot takes classroom quizzes and turns them into a game. Questions are presented on the teacher’s screen and students can answer via their cell phones. Once the question has been answered, students get feedback on their screen and the teacher can see how many students got each question correct or incorrect. Quizlet – Quizlet allows teachers to create quizzes and tests that students can then access and complete on their own device. As students complete the quiz, it is graded automatically and the results are delivered to the teacher. Google Forms – Google Forms can be used to create quizzes and tests that students can access via their devices. Once students complete the form, teachers can see graphs and charts that students answer including percentages of correct and incorrect answers. Plickers – Plickers allows teachers to create multiple choice questions which students can answer using QR codes. These QR codes are images that can be read by the teacher’s smartphone to get students’ answers instantly. All the tools listed above use a freemium approach. Freemium tools are free to use for the basic version of the software. If the user wants added features, they can pay a monthly subscription fee and gain access to more advanced features. Each of the tools highlighted this month can be used with a basic account. teaching, testing, and research. Cambridge, MA: Cambridge University Press. Students love to play video games, but many teachers may have doubts about how they can be used for learning. Teachers who do not play video games often see them as a distraction that students spend too much time playing. Taking a closer look at video games shows us that these games are more than entertainment for our students. They are also platforms where students can create and share stories with other fans of these games. Teachers who do not play video games can still take advantage of these games and their affinity spaces in the language classroom. Affinity spaces are both real and Internet-based spaces where people with similar interests can gather together to interact and learn from one another. In the case of video games, these affinity spaces are often English speaking and our students can often be motivated to learn English so they can interact with others who share their love of a particular game. In this week’s Teacher’s Corner, we will explore ways we can take advantage of video games for the language classroom even when we do not play video games ourselves. Video games are the new media literacy – We are all familiar with the traditional forms of media: music, books, movies, and television. For many of us, these ‘big four’ media have existed our whole lives. As a result, we understand them and use them frequently for relaxation, entertainment, and learning. Video games are now the fifth major literacy (Squire, 2008). Teachers use each of the other four media in the classroom and now that video games have joined the list of major media literacies, it is time we use them too. Video games are the first interactive literacy – What makes games a powerful media is their interactivity. Music, books, movies, and television are all ‘one-directional’ literacy; we can consume them but not change them. Our students love video games because unlike traditional literacies, games are interactive. Video games respond to the choices we make as a player, and the story changes as a result of these decisions. This ability to make decisions and see the results is engaging and motivating for our students. When students play games, they have an experience that they can then share and discuss in the language classroom. Video games are big business – The video game industry is now the largest media industry in the world, making more money each year than either the movie or music industry. For teachers, this is important, as we should recognize that our students may want to work in this industry. The video game business is a global business with games being made in countries around the world by globalized teams. Many of these positions require fluency in English. If you have students who dream of making games in the future, take time to remind them that working in the video game business means knowing and using English. Video games can take our students to America – The fastest growing area of video games is e-sports. In e-sports, teams of players compete in organized competitions across the world. This year’s DOTA II International e-sports competition saw teams of players compete for USD $20 million in prize money. These teams are international teams that all use English to communicate. Even American universities are developing e-sports teams. This year the Pacific Area Conference (PAC 12) made up of universities in the western part of the United States will begin hosting and organizing e-sport competitions. A student’s video game playing could get them a scholarship to the University of California Los Angeles, Arizona State University, Oregon State University, and many other universities. How can I use videogames? If you do not spend time playing video games it may be hard to know how to use them in class. A great place to start using games in the class is by taking advantage of the affinity spaces around games and incorporating these into the classroom. This helps us in two different ways: students can bring their love of video games into the classroom, and we as teachers can learn about the games our students play through their homework assignments. Game Reviews – Besides video games as software, there is a large industry around video games. Entire websites are devoted to reviewing games, reporting video game news, and watching e-sports. Students can use these websites for reading practice and learning about genre writing. Students can visit game review websites to learn the structure and organization of game reviews, which provides reading practice within a context. They can also study the structure and organization of the video game review and write their own review as homework. Students can get language practice, and you can learn about their favorite game. Podcasts – For students in need of listening practice, video game podcasts can be a great resource. Many podcasts such as Kotaku’s Splitscreen discuss video game news and reviews, while others such as Designer Notes interview game developers and teach the art of making games. These podcasts can be an effective way for our students to develop their listening skills in context. Even better, encourage your students to make their own video game podcasts to share with you and their fellow students. For more on podcasts, see our American English Webinar Series webinar on Podcasting for the Classroom. Fanfiction – Fanfiction is the taking of characters from our favorite media and creating new stories that use these characters. For example, students may read or watch The Hunger Games and then write their own story using the characters of Katniss and her friends. They can do the same with video games. If students have a game they play often, allow them to use a writing homework assignment to introduce you to their favorite character. Students can describe their adventures in the video game or use their character in a completely new story. Remember, your students may have many things to write or discuss about a video game character, but they will not bring those ideas to class until they have been given a space to do so. Machinima – Machinima, which is the act of making movies using games, uses video games much like a theater stage, and players use the game as a background to tell their own stories. When making machinima, players write dialogue scripts, plan background sets, and then record their performances. These videos are then edited and posted online for others to share. Making Machinima may seem too complicated for the classroom. However, the students can take care of the technology, so do not worry if you are not familiar with the tools. Instead, focus on providing the students the opportunities to work on such projects as part of your class homework. The students are and can even teach you how to use them, which is an excellent example of 21st century skills. When considering how to use video games in the classroom, consider how they are another form of media. We can encourage our students to discuss their favorite music, books, movies, and television shows in the classroom as part of conversation practice. Now it is time to add video games to that list. If students are provided the space and opportunity to bring their knowledge to the classroom about video games, they can be a rich source of communication and a useful tool for learning English. If you want to bring specific games or game-related activities to your classroom, check out the September 2015 Teacher’s Corner to learn more. Squire, K. (2008). Video-game literacy: A literacy of expertise. In D. Leu, J. Coiro, M. Knobel, & C. Lankshear(Eds. ), Handbook of research on new literacies (635-670). New York, N.Y.: Lawrence. Earlier this month in Teacher’s Corner, we explored the 21st Century Skills, which encourage student creativity, problem solving, and collaboration as an approach to teaching and learning. In a traditional classroom space, it can be hard to give students the freedom to engage in these types of skills. As a result, there has been an increasing trend in education for schools to develop physical spaces in a school where students can have more open space to engage in project-based activities. These are called makerspaces. The projects can be entirely decided by the students or centered on a theme such as environmentally-friendly projects or projects that must serve the students’ locally community. Everyone is a maker – makerspace projects can be as simple as painting a picture to as complex as building a robot. What is important is making, even if what you make is messy and not perfect. Our world is what we make it – makerspaces encourage students to be more than consumers. These spaces encourage them to reuse and recycle to make new things. Being environmentally friendly is at the heart of the makerspace movement. If you can imagine it, you can make it – makerspaces use students’ natural curiosity and imagination. If students can imagine it, they can build with enough energy, time, and support from teachers. Do what you can, where you are, with what you have – a makerspace does not need to be technology-focused. A makerspace can be as simple as a table or room with paper, cardboard, and markers. We share what we make, and help each other make what we share – makerspaces are collaborative and students are encouraged to learn from one another. Teachers and students are equal partners in the makerspace. How do I create a makerspace? Building a makerspace begins with the learning space. These spaces look more like workshops than classrooms. These spaces tend to have long rows of tables with only enough chairs for each student to have one. By working at long rows of tables, students can see the work being done by others and communicate freely. Also, keeping the number of chairs to a minimum helps by giving students room to get up and move around. In makerspaces, it is critical for students to be able to move freely around the room, so teachers should avoid requiring students to stay in their seats for long periods of time. If your school doesn’t have a room to build a makerspace, a classroom can still be used; just move unnecessary tables and chairs into the hallway during makerspace times. Many makerspaces begin as an after-school club that meets once or twice a week. These less formal after-school clubs can be a great way to discover what makerspace ideas work best for your teaching context. If you provide the space, students will provide the creativity. Paper and Cardboard – cheap and easy to find, these two materials should be in every makerspace. Students can use these two products to begin rapid prototyping. In rapid prototyping, the goal is to go from idea to product quickly. The first build can be messy and rough, but it should help students focus their ideas. Paper and cardboard are great for this. Two liter bottles – plastic bottles are another great makerspace resource. They can be used to make bottle gardens, or the plastic can be used to make new projects. Glue, string, and tape – makerspaces always need basic tools to help students build their projects. When starting a makerspace, don’t forget basic tools that can help students combine cardboard, paper, and plastic. Audio Recording – If you have musical students, have them use the makerspace to write and record their own songs. Students looking to make music can use tools such as Audacity, an open-source audio recording and editing tool. Open-source tools are software that can be downloaded and installed for free by users. Users of open-source tools can then change the software code to make changes or improvements to the original software. For more on using Audacity, check out the September 2015 Teacher’s Corner. Game Design Tools – Encourage students who love video games to stop playing them and start making them. A variety of online tools can teach students how to make their own video games. In your makerspace, include such tools as Gamestar Mechanic, Kodu, and Scratch. Programming – The 21st Century Skills are designed to prepare students for the jobs of the future and many of those jobs will require coding skills. Students can learn the basics of computer coding through a variety of websites such as Code.org, Hour of Code, and App Inventor. How can a makerspace be used for english language learning? Project Instructions – Students can create written instructions on how to use their creation. For example, the makerspace could have as its focus student teams building a device or project that helps the environment. Once they complete their project, the teams must write instructions in English on how to use their device. Advertisements – For a fun writing and speaking activity, teams of students can create commercial advertisements for their project. The advertisements must show what their project is and how it can be used. These advertisements can then be shown in class for a student-created listening activity. Project Show-and-Tell – During the creation process students can share their progress in show-and-tell progress reports. In these presentations, teams of students can present their ideas to the other makerspace teams. The teams can discuss their successes and failures in developing their project and provide suggestions to other teams. Teacher Instructions – Another way to introduce English into the makerspace is to provide students with instructions entirely in English. Using some, or all, of the ideas listed above can help get your makerspace started. As a makerspace instructor, it is important to create an atmosphere that encourages students to learn by doing, to communicate and collaborate with their classmates, and to learn from one another. So have fun and make something! Create to Communicate - This book provides ideas on how to use art to encourage students to use the English language. Many of the ideas presented can fit directly into a language-focused makerspace. The book can be downloaded by section or as a whole. Make it yourself – Casa Thomas Jefferson opens Makerspace - Learn more about how a makerspace is being used for English education. Makered.org - Maker Ed is home to the makerspace for education movement. On this website you can find materials on using makerspaces for learning. Makerspace Playbook School Edition - This downloadable book can help you get started in creating a makerspace at your school. Youth Makerspace Playbook – This is similar to the Makerspace Playbook listed above but with a focus on makerspaces for younger learners. Just make it! How makers are changing everything - This article provides a brief overview of makerspaces and how people are using them to create new ideas and products. US College Libraries in the Digital Age – Read this Voice of America article about how the digital age is changing libraries from a focus on books to a focus on creating. Will Technology Benefit Very Young Children? - This is a Voice of America article on how even young learners are using makerspaces to interact with the digital world.